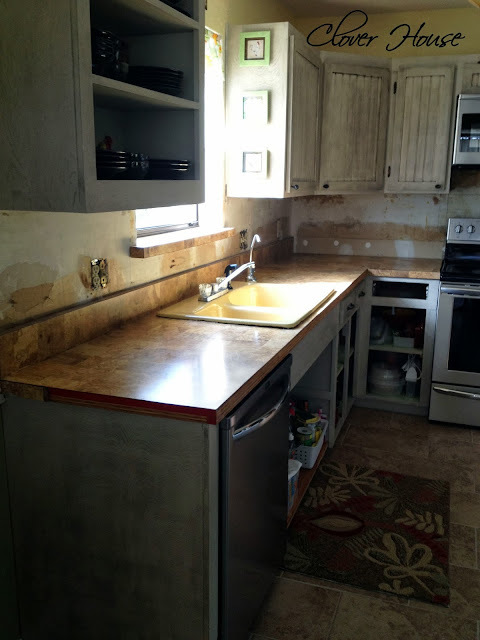 Farmhouse sink? Yes please! 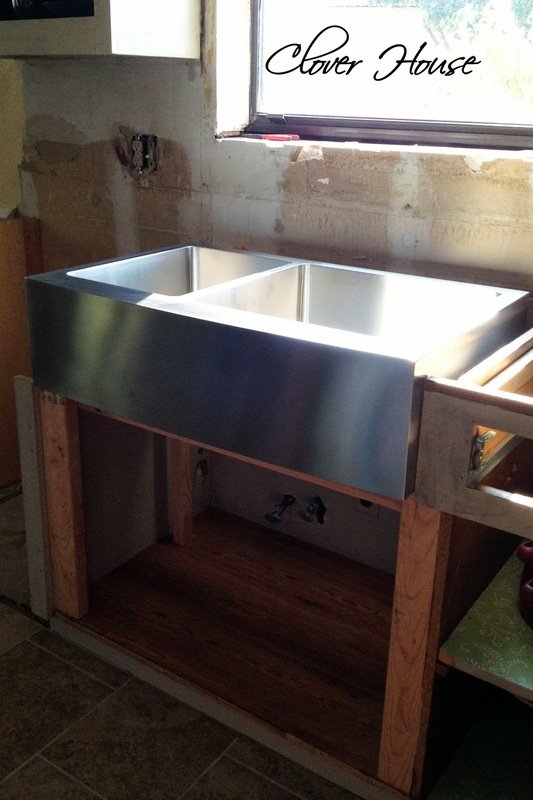 I was all about a farmhouse sink for our newly remodeled kitchen, my honey was a bit skeptical on how he was going to get this monster installed! But he did it and he did a fine job! 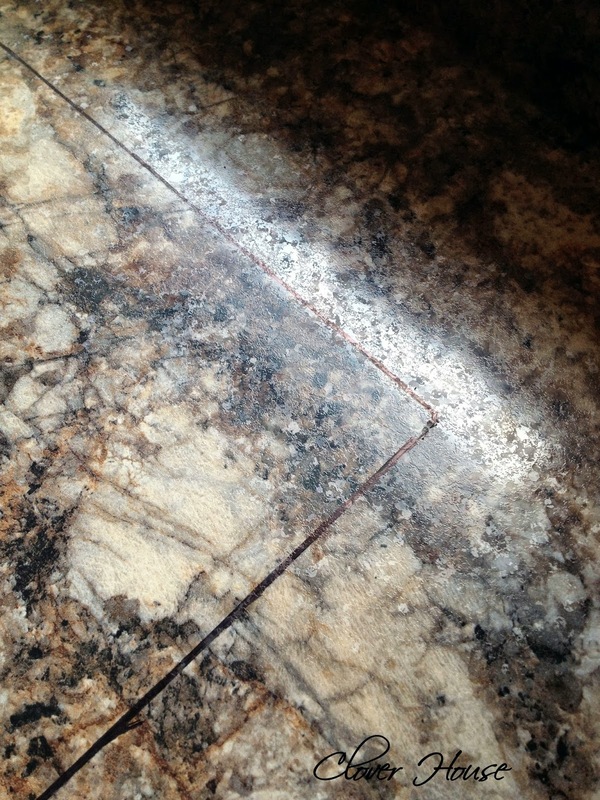 It was a bit more than cutting a hole in the counter top and dropping it in. These things are HEAVY! Ours is a Kraus stainless steel sink so its not near as heavy as the Firestone sinks, but its still very heavy. This is our old harvest gold porcelain coated cast iron sink. She served us well for the past 2 and 1/2 years. I even showed you how to make her look new again HERE. Here's our new beauty! She's a Kraus Handmade 16-Gauge Double-Basin Apron Front Stainless Steel Kitchen Sink from Lowe's.com. They do not offer these in store at our local Lowe's so it was a shot in the dark that we were going to love our sink when it arrived. No worries! We loved it! I also found it here too! This is our old counter top and sink one last time. It's a good thing I snap pictures of everything because until I looked at these pictures again, I had already forgotten what it used to look like. On to the install of the new sink. Note: throughout this post when I say we, I actually mean my honey. (Love you baby!) First, we disconnected the plumbing from the old sink. Be sure to put down an old towel for the water that will leak out of the plumbing pieces. 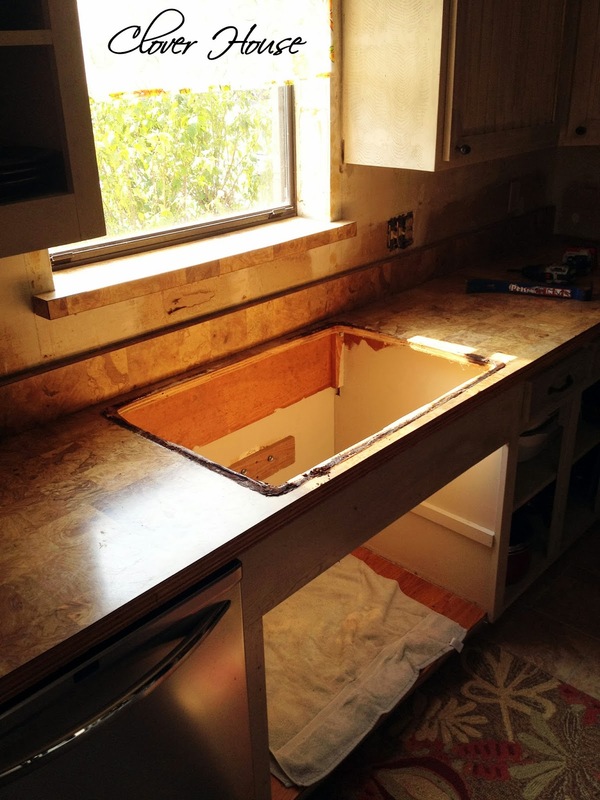 Next, we removed the old counter top. 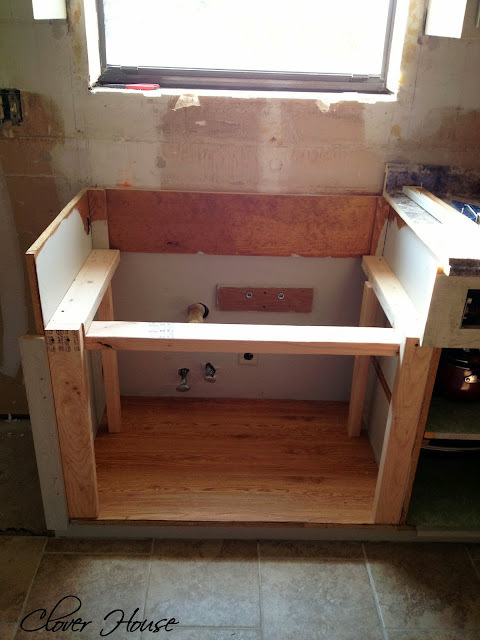 Remove brackets holding the counter top to the cabinets and it should just lift up and out. 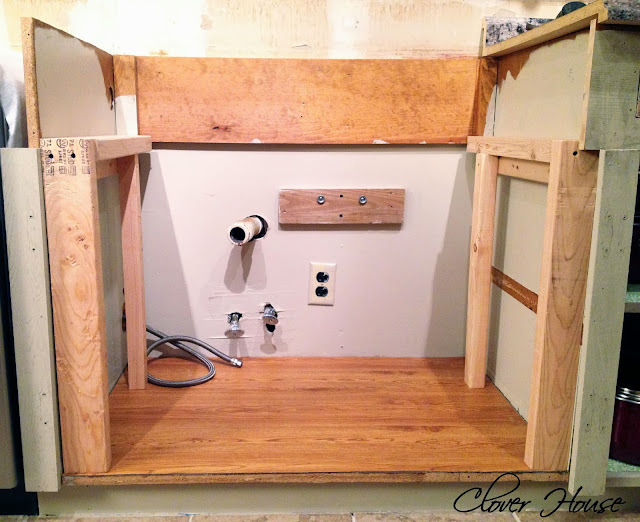 We had to cut out the front of this cabinet so it could accept the new apron front sink. We've found that our shop vac is our good friend during all the cutting going on inside the house. This helps to keep things as clean as possible. 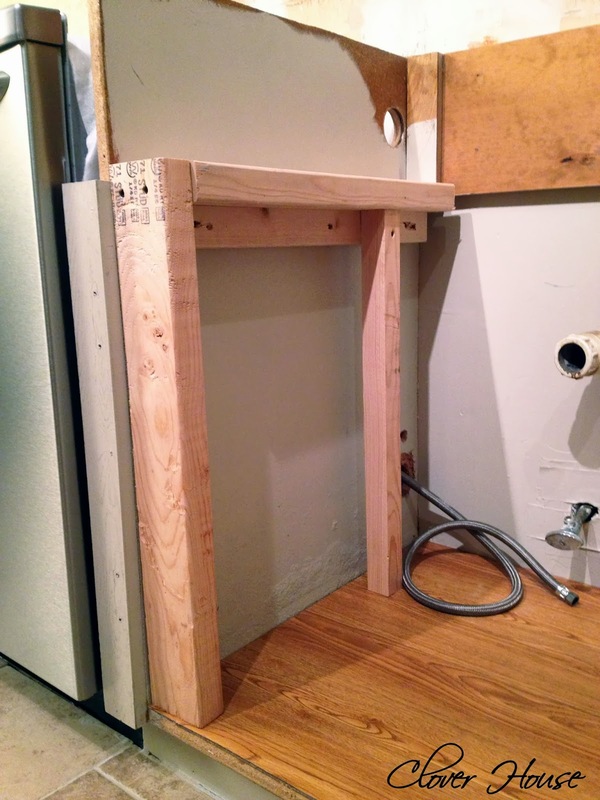 Next we built the support for the new heavy sink. We used 2 x 4s to be sure it was going to be sturdy for the long haul. 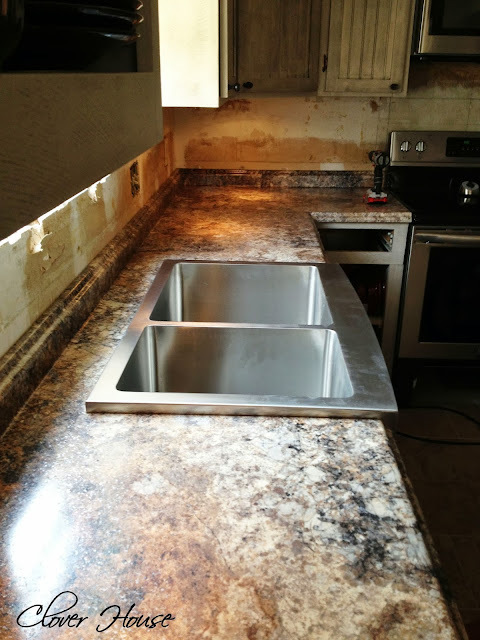 Of course, your measurements will more than likely differ from ours so before you start, make sure of where you'd like your sink to rest permanently. With this style sink, you can mount it under the counter top or above. We chose above. This final piece was to make sure the whole cabinet was sturdy and would support the weight it was about to receive. I sat on it to make sure! LOL! Next is the test fit. Believe me, we held our breath because it was a snug fit. YAY! It fits! You want it to be snug so its sturdy though. Great job Honey! After we installed the new counter top, it was time to mark the spot to cut the hole for the new sink. I taped around the top edge of the sink with frog tape to prevent the black sharpie marker from getting on the new sink, we wouldn't want that...oh no! 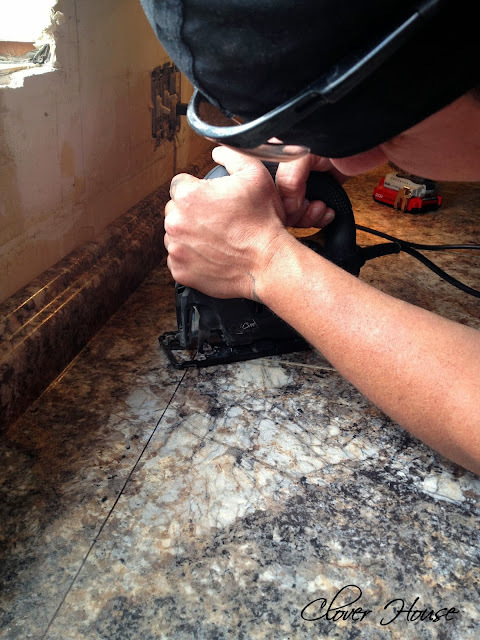 With the sink upside down and in the correct position you intend on installing it, mark your cut line with a marker. FYI: Measure, measure and re-measure and then cut! We used a jig saw to cut the counter top. It seemed to be the best choice for a more steady even cut. It's also easier to see where you are going compared to using a circular saw which was the other choice. At the corners we used a drill to make a hole so it was easier to turn the jig saw and keep the corners crisp and sharp. Remember a shop vac comes in handy while the cutting is going on. The person cutting can see where he's going a bit better and the mess stays lower. 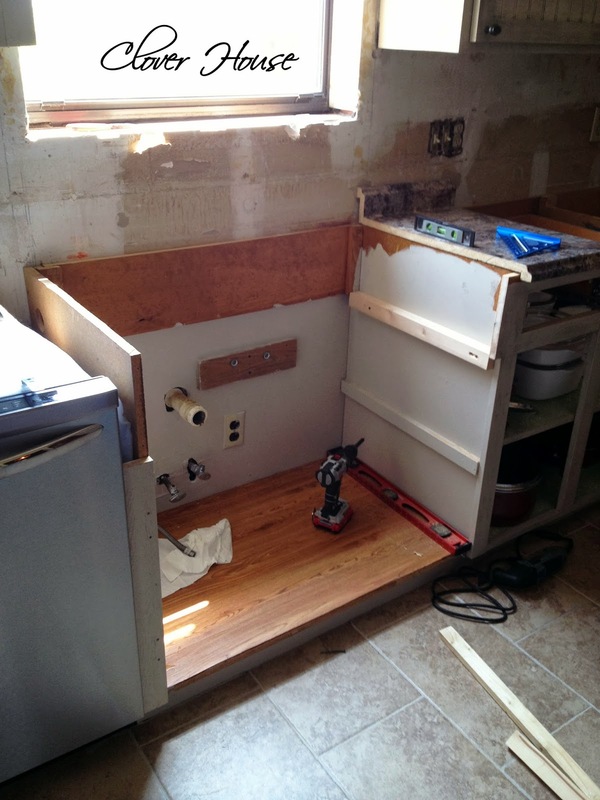 Next, you say a little prayer, hold your breath and fit the new sink into the freshly cut hole. YAY, it fits! We used clear silicone around the sink to assure no water could get down to the exposed wood of the cut counter top. This also adds to firming up the sink in its final resting place. This is where we are now. 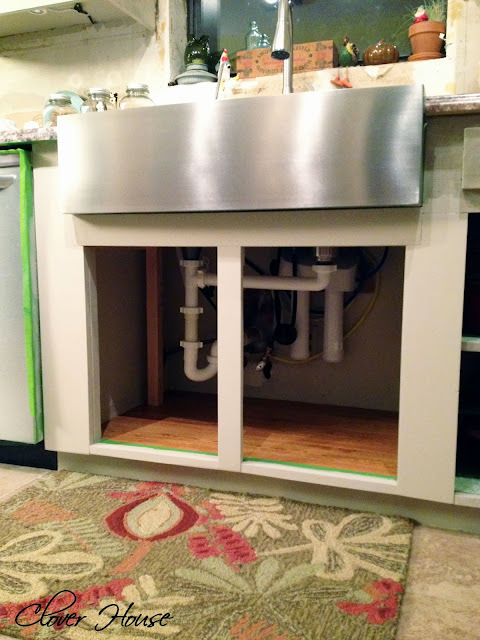 Since we didn't really know where the cabinet doors would be before we installed the sink and faced out the front of the cabinets, that chore (building doors) is still left to be done.....along with a good dozen more things to do before we're done! 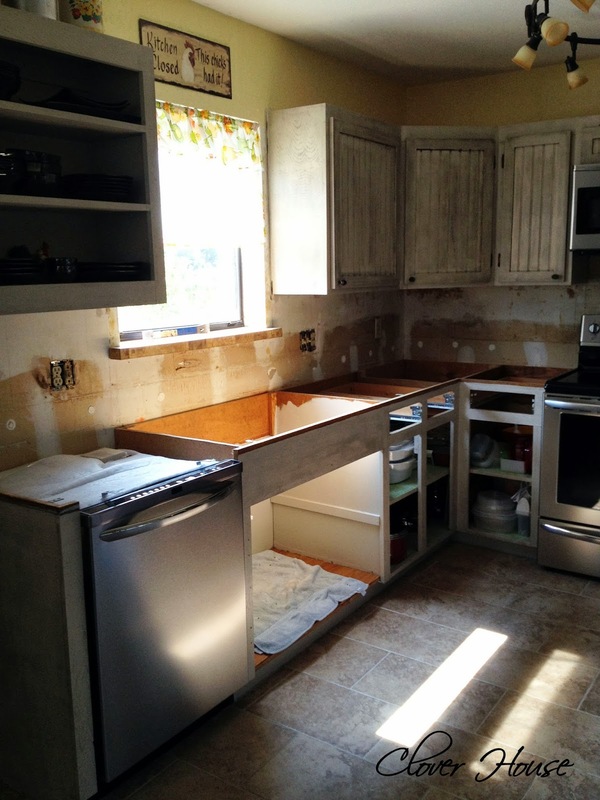 Would you like to see more about our kitchen remodel? I think it looks smashing! It's a beautiful sink. And you're so lucky to have a hubby who can do that sort of thing! FABULOUS! I love sinks like this! My husband and I are in the process of buying a new house. A nice deep sink is something we both agreed on putting in to our new kitchen. 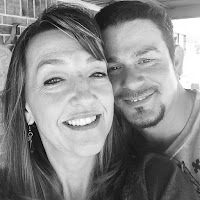 I am glad I found your blog! Looks really good. I have been thinking about doing the same thing. How deep is the sink? Your new sink looks beautiful! 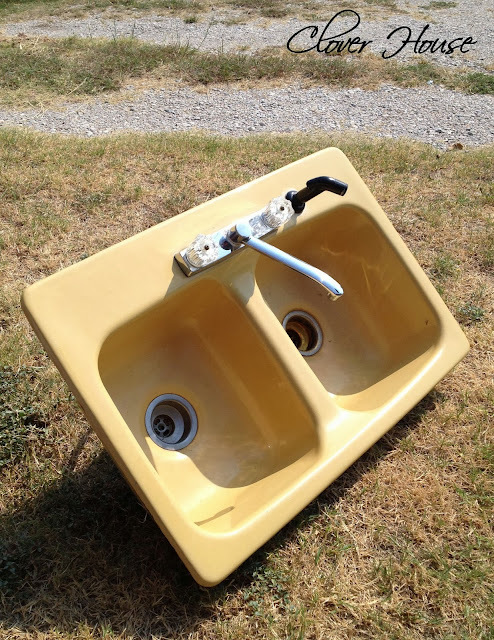 I DREAM of a farmhouse sink. Thanks for the great D.I.Y post. Wow, you guys did a wonderful job! 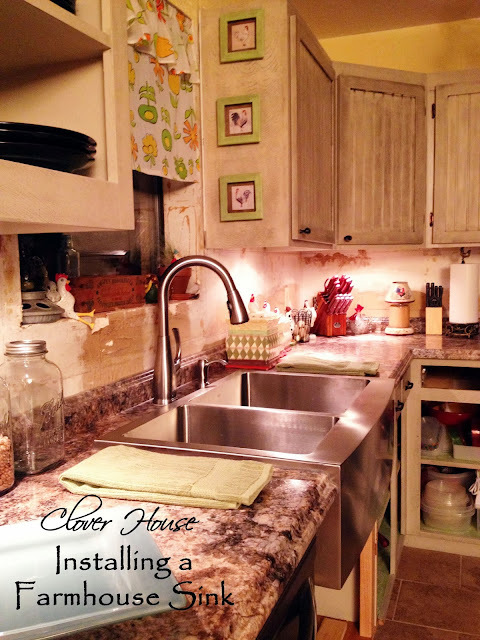 I love farmhouse sinks...they always add such a great effect to any kitchen. I love farmhouse sinks too! You did a fantastic job. It looks great. It's gorgeous! Well done. Thank you for sharing with the Clever Chicks Blog Hop! 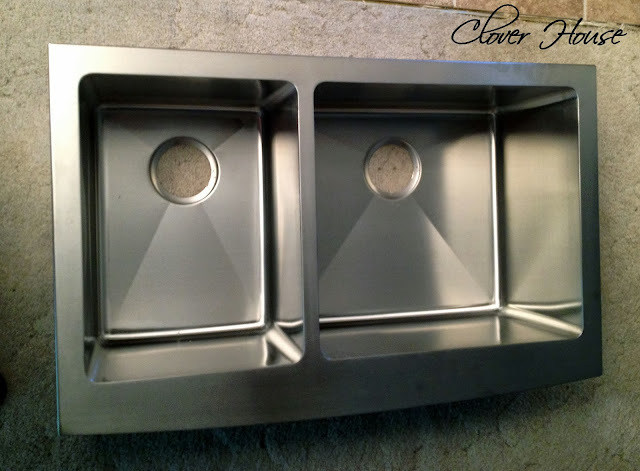 I love farmhouse sinks too - never seen a stainless one before. Looks great! I fell in love with the Kraus line of farmhouse sinks the moment I saw them online, but hadn't seen anyone showing installation. Bless you! 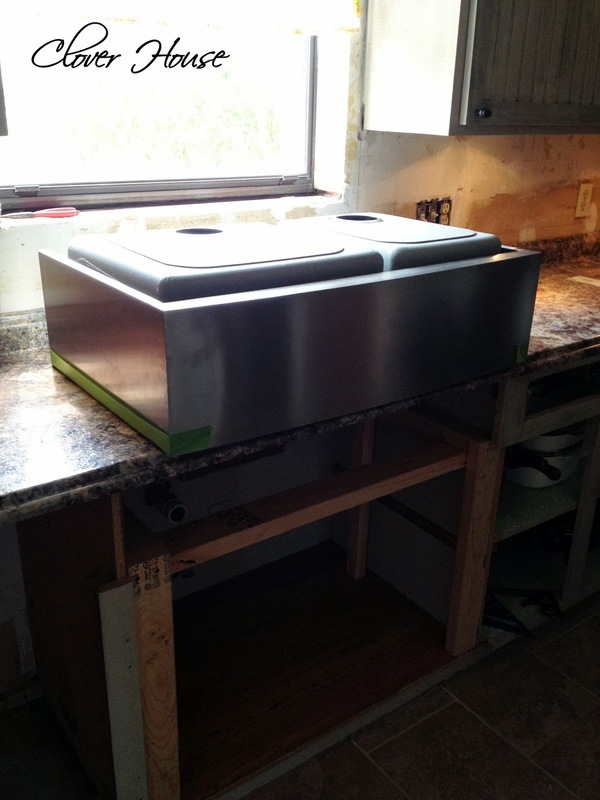 I now have an idea of the process and can point my contractor (aka my husband!) to your post. Ours is the biggest they make. Why did I get a huge one? I frankly do not know, except that we will probably be able to bathe children and wash enormous pots!